An American Inside Edition TV show has produced a report on how to ‘safely’ find a parking spot after the nation was shocked by the killing of three Muslim students in what their relatives believe was a hate crime. 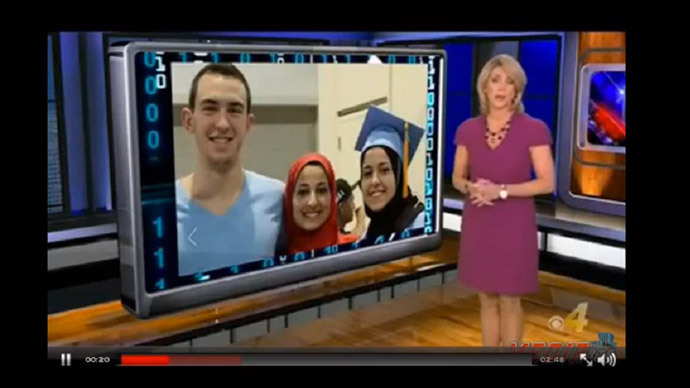 The Inside Edition show, produced by CBS Television Distribution, decided to make the report following the deadly shooting of three Muslim students in Chapel Hill, North Carolina, allegedly by their neighbor, Craig Hicks, in an apparent dispute over parking spots. Police do not believe the murders were motivated by race or religious hate. However, the relatives of the deceased think otherwise. Social media has been up in arms at the program and its host, Deborah Norville, after Inside Edition, a 30-minute news magazine program, showed a report on how to avoid road rage and confrontations when looking for a parking place. Numerous internet users also took to Twitter to make their feelings known, and words such as “offensive,” “outrageous,” and “speechless” are some of the more printable reactions to Inside Edition’s report. Inside Edition used the Chapel Hill murders to set up a segment on finding parking at the mall. I wouldn't expect anything more. Condemnation of the report has been widespread, with Twitter users of all races and faiths showing their disgust at the show on CBS. The report starts by showing a number of YouTube Videos of car drivers losing their cool over parking disputes. It then advises drivers to ‘stalk’ shoppers returning to their cars after a shopping trip, as this may lead to a spot being freed up. Deah Shaddy Barakat, 23; his wife, Yusor Mohammad Abu-Salha, 21; and her sister, Razan Mohammad Abu-Salha, 19, were shot in the head on Tuesday, February 10. The father of the two girls, psychiatrist Dr. Mohammad Abu-Salha, told the Raleigh News & Observer that, while parking may have been the catalyst for Tuesday’s events, the shooter had an underlying animosity towards his daughters and son-in-law based on their religion and culture. “Honest to God, she said, ‘He hates us for what we are and how we look,’” he said. Both women wore hijabs, the traditional Muslim headscarf. The gunman Craig Hicks turned himself into police and is being charged on three accounts of first degree murder. The 46-year-old was a self-described atheist, who regularly posted content critical of religion on his Facebook page. Despite police suspecting the murders occurred because of a parking dispute, the FBI has opened a preliminary inquiry into whether or not any federal laws were broken related to the case, Reuters reported. Those laws could include civil rights violations or the committing of a hate crime. Since September 11, 2001, anti-Muslim hate crimes have consistently stayed anywhere from 100 to 150 in number per year. Of all hate crimes; anti-Muslim offenses make up about 2 percent. Before 9/11, though, the FBI says there were only about 20 or 30 anti-Muslim hate crimes per year.